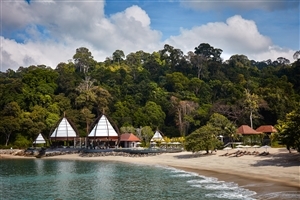 Embraced by verdant tropics and greeted by azure waters, the Ritz-Carlton Langkawi invites any and all travellers to ease back into this private cove and enjoy the sights and sounds of Langkawi. Choose from a wide selection of rooms and villas that best suit your needs and start each day feeling completely rejuvenated as you wake up to gorgeous views of the surrounding area. 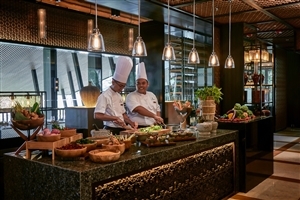 Tempt your palate at any one of the in-house dining venues, relax with the soothing facilities and explore the area to your heart’s content to uncover some of the most beautiful vantage points in all of Malaysia. 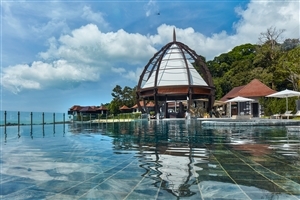 Facing the gently ebbing tides of the Andaman Sea, the Ritz-Carlton Langkawi brings a sense of opulence to the north western isles of Malaysia, providing an attentive level of service and luxurious comforts to accompany the lush, tropical setting. 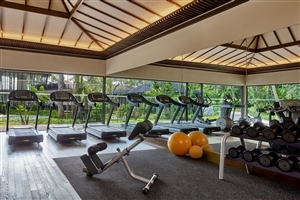 Enjoy the fine flavours of the in-house eateries, spend some time utilising the soothing and recreational facilities and settle in to your chosen room or villa to start feeling the rejuvenating benefits of this lavish getaway. 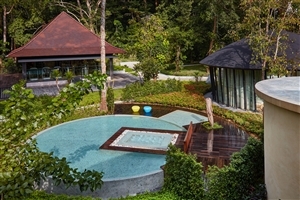 Whether you’re looking to explore the surrounding area to uncover its many wonders or simply wish to ease back and relax, the Ritz-Carlton Langkawi has you covered. Ranging from 75 m2 to 85 m2, the Rainforest Deluxe rooms have a spacious balcony, a separate living space and a dining area while boasting either a king-size bed or two queen beds ideal if you are travelling with a friend. With a door connecting two neighboring units, the perfect accommodation choice for a family! While able to keep an eye on your children, once the door is closed, you have all the privacy to enjoy intimate moments with your partner. With 100 m2 the largest accommodation within the block, the rainforest suite boasts a spacious bedroom, a dedicated living area and a cozy dining alcove along with an expansive outdoor terrace. 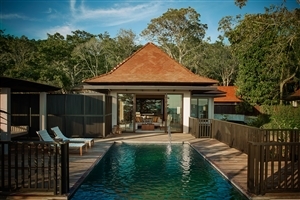 Set at the edge of the jungle, the 200 m2 Rainforest Villas are designed with the nature lover in mind. 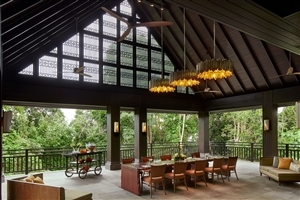 The floor-to-ceiling windows make the lush rainforest greenery an inseparable part of the indoor ambiance while providing an amazing opportunity to observe wildlife. 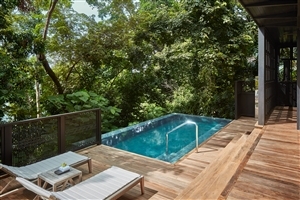 The rainforest canopy provides a soothing shade as you rest on the spacious sundeck or cool down in your private pool - with the turquoise sea shimmering through the rainforest trees. Only a short stroll away from the Spa, the Sunset Bar and the Chinese restaurant that all enchant with spectacular sea views, you get the best of both worlds. Set along a rocky coastal stretch, the 200 m2 Ocean Front Villas boast floor-to-ceiling windows that provide spectacular panoramic views of the infinite sea. Perched above rocky outcrops, the expansive multi-level sundecks with a cozy outdoor pavilion and a private pool enchant with the sound of crashing waves that will lull you to sleep as you enjoy the famous tropical siesta. Only a short walk away from the Spa or close to the tranquil alcove, the Ocean Front Villas provide a holiday experience that revolves around calm, peace and serenity. With 300 m2 the resort’s largest one-bedroom residences, the lavish Grand Ocean Front Villas provide an expansive living space along with mesmerizing ocean views. With primordial rocks rising from the sea right in front of the spacious multi-level sundeck, you get to watch the spectacle of waves as they break against the giant boulders, filling the air with thousands of sparkling water drops. Boasting a large private pool and a cozy outdoor pavilion, the exclusive signature villas tempt with tranquil luxury and leisurely hours of day dreaming under the equatorial sun. Placed along the smooth curve of the resort’s main beach, the 280 m2 villas lure with a direct access to the beach and with private pools, spacious sun decks and cozy pavilions perfect for a leisurely afternoon siesta with a dreamlike sea view. 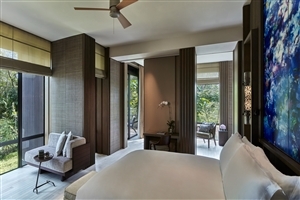 Boasting floor-to-ceiling windows and a beautifully landscaped atrium that lets in additional light, the villas are flooded by golden sunrays for a truly tropical holiday feel. Only a short coastline-stroll away from the main pool and the Beach Grill, and with the library, the kids’ club and the resort’s all-day-dining restaurant right in the back, the beach villas provide all the convenience you hope for when picturing leisurely holidays. Situated at the remote end of the bay and accessible via a private road that winds its way behind the mangrove lagoon, the extravagant Villa Kenari provides complete privacy along with the privilege of a hidden sandy beach shared only with the neighboring Villa Mutiara. With 465 m2 the resort’s second largest residence, the Villa Kenari boasts two bedrooms - each with a jungle view in the back and a spectacular sea view in front so that you get to experience the best of both worlds. Featuring the resort’s largest private pool and an expansive sundeck that overlooks the entire bay - the most luxurious tropical sanctuary you can imagine. 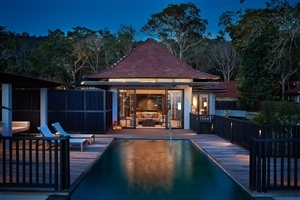 Reachable via a bridge that crosses a mangrove lagoon and located at the distant tip of a rocky tail between two coves, the spacious 650 m2 villa provides complete privacy, enchanting with a scenic 330 degrees’ ocean view and opening in the back to the rainforest. 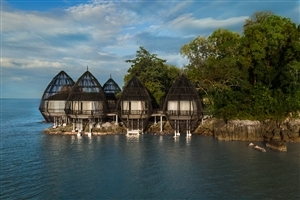 An epitome of luxury, the spectacular villa with access to a private beach with a dreamy cabana beautifully combines the overwater, beach and jungle experience - allowing you to experience at once everything that makes The Ritz-Carlton Langkawi so unique. With three lavish bedrooms, a spacious dining area and two pools - the perfect hideaway for families and close couples who appreciate the extraordinary. Langkawi Kitchen – Langkawi Kitchen is a casual restaurant offers Malay, Chinese and Indian cuisine, mirroring the diversity of Langkawi’s local culture. Clean modern lines and rustic textured touches give the restaurant a unique atmosphere of relaxed chic, with windows and bright wood keeping it true to its resort theme. Beach Grill – The Beach Grill serves up western favorites at the beach front. Open throughout the day, the restaurant features an alfresco bar, with cocktails and a fine selection of wines. Hai Yan – This exclusive restaurant sits at the tip of the resort, serving authentic selections of Chinese seafood in luxurious yet warm, inviting ambience. 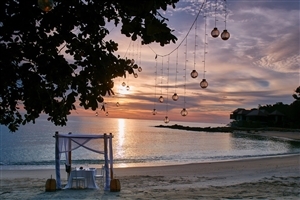 Perched at the water’s edge, diners get to enjoy every dish with breathtaking 180º views of the Andaman Sea. The restaurant is divided into a main dining area and 2 private dining rooms that can be opened by panels to accommodate larger groups. 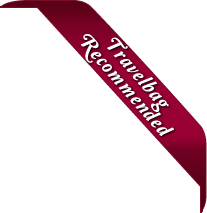 The beverage list features a wide selection of boutique wines along with aged teas. Horizon – The adults only Horizon is perched above natural rock and features a pool overlooking the horizon. It offers an intimate environment with Thai influence to enjoy the romantic sunset and unusual wines, designed for a relaxing lingering night with friends.